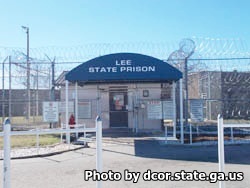 Lee State Prison is located in Leesburg Georgia. It is a medium security institution that houses 762 adult males who have been convicted of committing a felony. Inmates are housed in eleven units that have eight rooms, each room contains 6 beds/inmates. Two additional units have 24 cells with four beds/inmates in each cell. Isolation/Segregation inmates are held in 16 cells that have two beds in each, these cells are for inmates who are difficult to manage or have safety and security concerns. Select offenders can leave the institution on work crews that offer labor services to various departments within the county, including the department of transportation, local colleges, the recycling plant, fire station, and pond maintenance. Inmates also have educational opportunities that include learning to read, adult basic education and earning a GED. Counseling is available to everyone for a variety of reasons including substance abuse, family violence, behavioral modification, and preparing for re-entry. Vocational skills taught at this facility include automotive repair, HVAC, culinary arts, custodial and building maintenance, waste water treatment, clerical work, carpentry, barbering, laundry services and horticulture. Visiting is on Saturdays, Sundays and State recognized Holidays from 9am-3pm.